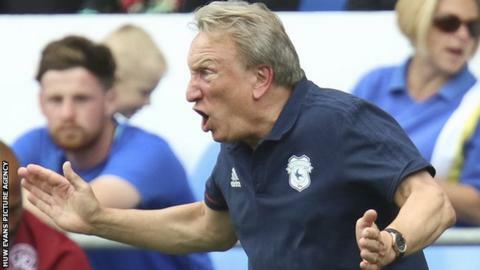 Cardiff City manager Neil Warnock wants to strengthen his side further despite their perfect start to the Championship season. The Bluebirds made it five wins out of five with a 2-1 victory over Queens Park Rangers to stay top of the table. But Warnock will be asking for funds ahead of the transfer window closing at midnight on Thursday, 31 August. "Looking at the QPR game I was thinking there is one particular position we need someone," said Warnock. "I might ask the board if I can spend a bit of money to make an offer for a player." Warnock would not be drawn on the area he wants to strengthen, but there is a belief he could be keen to add to the options in the centre of his midfield. The manager revealed he had already approached several clubs to try to secure a loan, but is hoping to return now with money in his pocket. "There is one area where, if we lost one or two players, we would struggle. We can't afford that before January so I will be speaking to them [the Cardiff board]," Warnock added. "I've spoken to a couple of managers about players, but they did not want them to leave. But I only asked about them on loan. "Now I'm thinking of asking Ken [Choo, chief executive], Mehemt [Dalman, chairman] and Vincent [Tan, owner] about whether I can put an offer in and try and buy one. "We are in a good position. There's just one area I think we are a bit weak so I'll ask them and they've not said no to me yet." QPR were the latest side to succumb to Cardiff in the Championship and Warnock said confidence was high within his squad. But he warned there was a long way to go in the campaign despite the excellent start. "It's fabulous to get five wins," Warnock told BBC Wales Sport. "You can see we are enjoying it. They are playing with a smile on their faces. It's a good place to be at the minute. "I wish the league ended tomorrow, but it doesn't, we've got a long, long way to go."